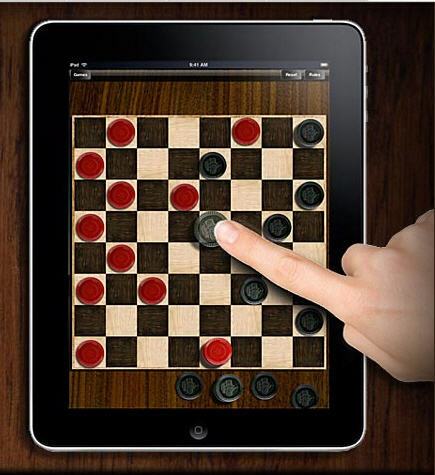 The boardgame and boardgame-related releases on iPhone and iPad continue to increase. While that’s a great thing for gamers, it does mean it can become difficult to sort through which games are worth a deeper look. The trend of including multiplayer play continues, both with new games as well as updates to older titles (BattleLine was just upgraded for online play, while Ticket to Ride had a pass and play mode recently added.) What follows is a slice of games released in the past couple of months with at least some boardgame or strategic elements. Some provide a very polished experience (I’m looking at you, Ascension), some are simply off-the-wall unique (Yoomi and Duo), while others simply hold a large promise of things to come (insert “Everygame” here…) Perhaps the strangest theme of this column are the number of games that are near blatant rip-offs of popular boardgames. I can’t condone that sort of thing (and have no hope of figuring the official legality of any of them), but perhaps the interest will show major publishers there is a market for many of their games ported onto the iOS platform. Special update: According to the PR folks for Ravensburger, Puerto Rico will hopefully arrive on the app store tomorrow on August 4th. Check the end of this round-up for a bit of teaser information. This little gem of a game is a full on Dominion clone. Most of the basic Dominion cards are present (there isn’t a Thief, for instance) and only one card that was unfamiliar to me (a 6 cost attack card that is +2 draws, gives a coin, and forces other players to discard down to 3 cards back on top of their draw deck). The theme of the game revolves around combat and military. Instead of money to buy cards you accumulate power, thus the “treasure” cards are all some form of army unit and the symbol for power is a pair of crossed swords and the victory point cards are defensive structures (Bailey, Tower, and Castle). Aside from the retheming, the only significant deviation from Dominion is that all victory points are doubled. This has almost no effect on the game, except it serves to make the “Garden” type card more valuable since it grants a point for every 5 cards in your deck and thus a deck size of 35 makes it a better card than the Duchy/Tower card. You can only play as a single player vs three computer opponents, although there is a nice little campaign mode where you must play games with special conditions like collecting a minimum amount of cash in your deck before the end. Statistics are also kept to let you know your winning percentages, fastest game, and highest and lowest scores. While I’d love to see a higher res version on the iPad, achievements , and options for multiplayer (although I’m not so sure how great that would work out) I’m torn about actually recommending the game. The similarities to Dominion are so very, very close I feel as if I’m playing something pirated. The game-space for a Dominion-like game isn’t all that large, so I would feel comfortable with a game that highly resembled Dominion and even had some basic similar cards (you need basic cards like Smithy, Village, and the like) but there wasn’t even an attempt to make any unique cards (other than the one previously mentioned.) If it were a physical card game, I wouldn’t even give it the attention of this article as I would consider it a knock-off. As it stands, I have to tell you about the game and just let your conscience be your guide. On the one hand, it is VERY VERY much like Dominion in almost all aspects (without having any sort of license) but on the other – it isn’t stealing any sales from an existing (or even in development) Dominion app. You decide. I was ready to write up glowing praise for this game, as I found it to be a very nicely done implementation of a game that I had heard about but had never been able to play. (The local gamers always seem to give it a play when I’m not around.) After several plays as Mr. X, I won a couple of times and was having fun. I didn’t get to try a multiplayer game, and I suspect that it would be great for cramped quarters (possibly 2 or 3 players) where the iPad can take care of all the game details. I wouldn’t want to play it with more players since examining the board seems to be so important. However, playing via Wifi or Bluetooth with players having their own screen seems more realistic (although I’ve heard reports the WiFi has issues). The game provides 4 ways to play (some convoluted set of times and ways Mr. X reveals himself) but I usually just went with option 1. The graphics are clear and present information well, but I did occasionally miss a detective pin while playing as Mr. X. It is a simple matter to make sure they are all accounted for before choosing your travel option. All this being said, it seems that the programmers did NOT obtain an official license for the game and have since been forced to take it off the app store. I only mention it here because it was a very nice implementation and think Ravensburger should think hard about either arranging an license or finding a way to do their own implementation. Ah, finally not a rip-off! 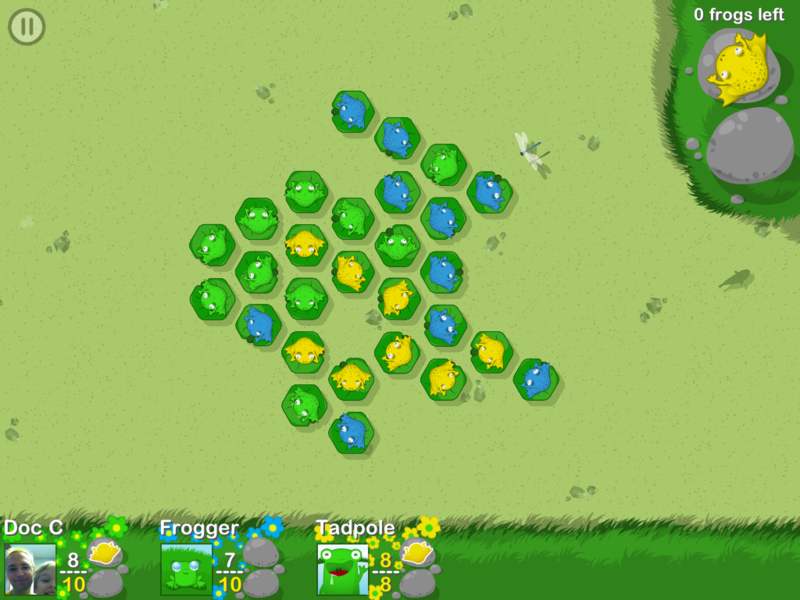 Army of Frogs is an abstract little game where you attempt to form up your colored team of frogs in a continuous chain (of seven or more) on a hexagonal board. Each turn you’re given the chance to move one of your frogs and then may place one of two frogs you have in your “hand” – note that you frequently have opponents’ frogs in your hand. The graphics are cute and clear and the game handles all the necessary rules of movement and placement by showing exactly where you can place your frog once you select it. The game can be played multiplayer or against a broad selection of computer AIs with different behaviors. Against moderate AIs I was able to start winning consistently after just a few games. The game includes achievements to unlock and I have to give a nod to making the iPad version a universal app rather than an iPad specific one. If you enjoy abstract games or are looking to show off your iPad to non-gamers this one is a good choice as the graphics are very welcoming but the gameplay has some nice potential for abstract strategy. Purists may not care for the minor luck factor that arises from placing frogs (I had at least one game where I lost before I even had enough frogs placed on the field to potentially win) but it looks to be a very nice middle-weight game. I admit I haven’t played all the versions of RISK running around on the app store, but from what I have seen, Conquist 2 is the definitive version. It is your basic RISK with the standard global setup, but there are also 7 other maps available on which to play. Some have roughly the same connectivity but are in new shapes while others diverge more significantly. 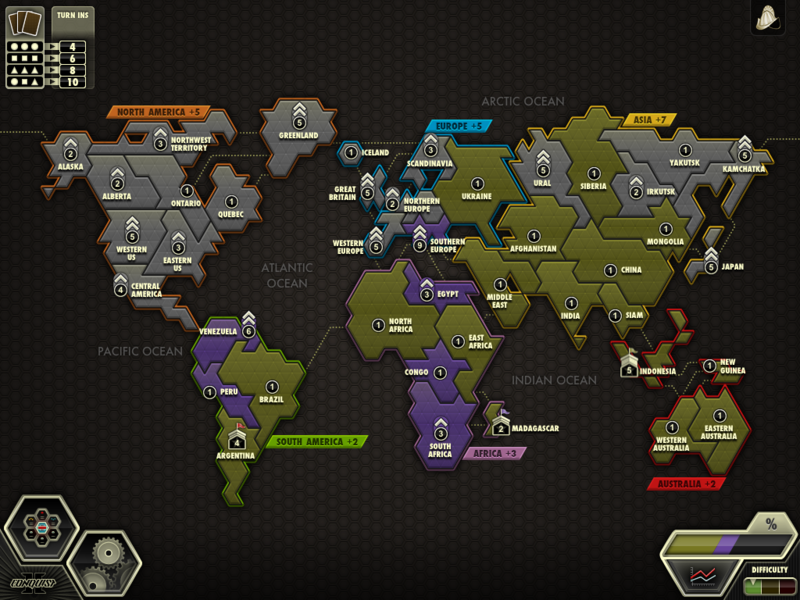 In addition to the standard way to play, you can also play a game with secret missions, colonization, or castle modes. In secret mission you are given a task to perform in order to win – that could be as simple as eliminating a specific player or as difficult as capturing two specific world areas. While interesting, I felt this version is slightly imbalanced as eliminating a player can often be much easier than trying to control two different continents. 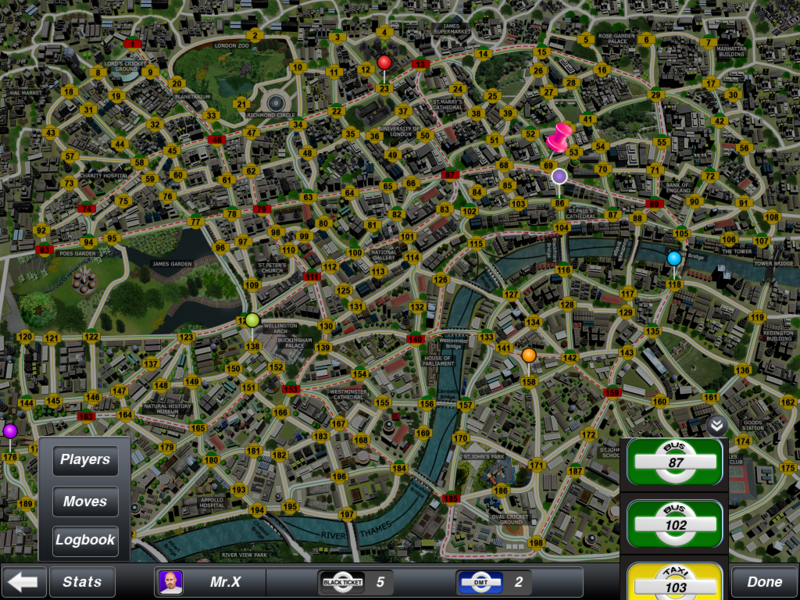 In colonization, players begin the game with all their pieces in a capitol city and must try to capture other players’ capitols. In castle mode, if you capture an enemy castle you instantly gain their territories and pieces, however there is a limit of 10 armies on any non-castle territory. It isn’t a perfect game, my one beef resides with the interface. Any RISK game worth its salt needs an easy and quick way to move and advance armies while attacking – while Conquist’s options aren’t bad, they could be slightly better. With a wide variety of gaming options, combined with a reasonable set of Game Center achievements, Conquist 2 is a solid title. There is online play (even rankings) available, but my RISK preferences usually lie with a quick solo game where I beat up the computer, so I wasn’t able to put the online gaming through vigorous testing. There is a free version available, so if you still haven’t found a RISK clone you prefer, you can give it a test drive for free. New World Colony is not a port of a boardgame, but it does contain a strong Euro-feel with just a hint of Ameritrash aggression added to the mix. At first glance, it looks quite Settlers-like with a randomized game board of hexagons of varying terrain representing production of the games three main resources (food, wood, and stone). Players claim additional adjacent hexagons by paying food and wood (and some gold) and thus increase their production (each hex produces 5 resources per turn – with a few hexes representing dual-land producing 10 resources of two types.) Players can also use resources to build production buildings that increase resources gained. 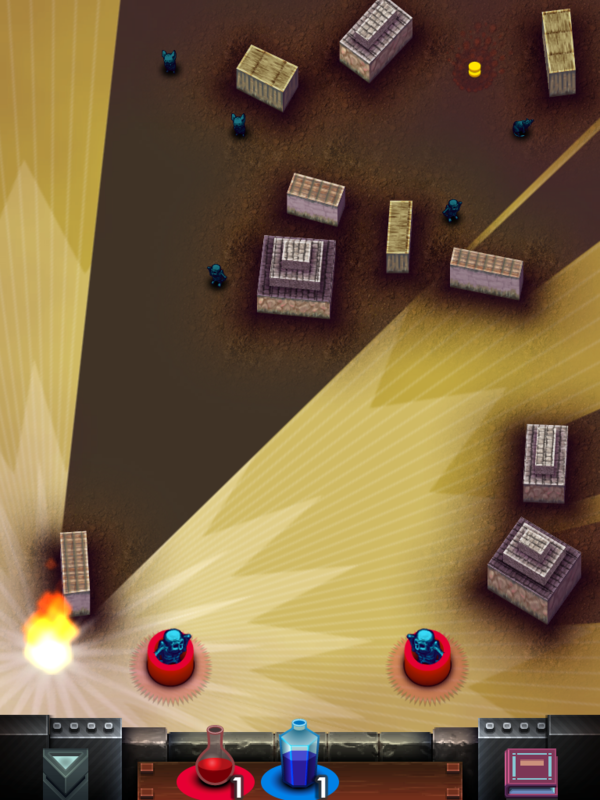 Eventually, players spread out enough to bump against each others’ territory and then attacks are possible. 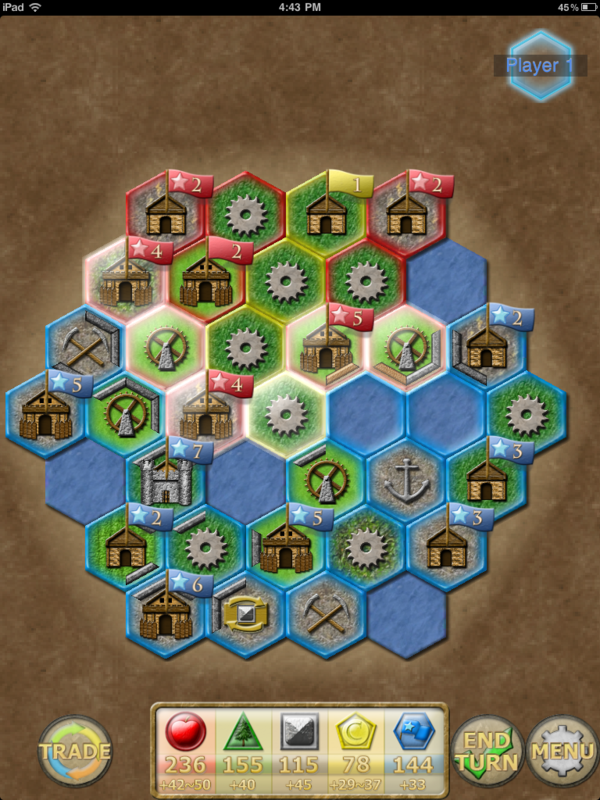 By paying resources (and victory points), a player can actually seize control of a neighbor’s hexagon. This can be made more costly by building and upgrading towns as well as wooden or stone walls. You will want to do this since towns (and forts and strongholds) are the way players gain victory points. Each round, you gain victory points for your towns depending on how well they’re upgraded and how large of an area they control. 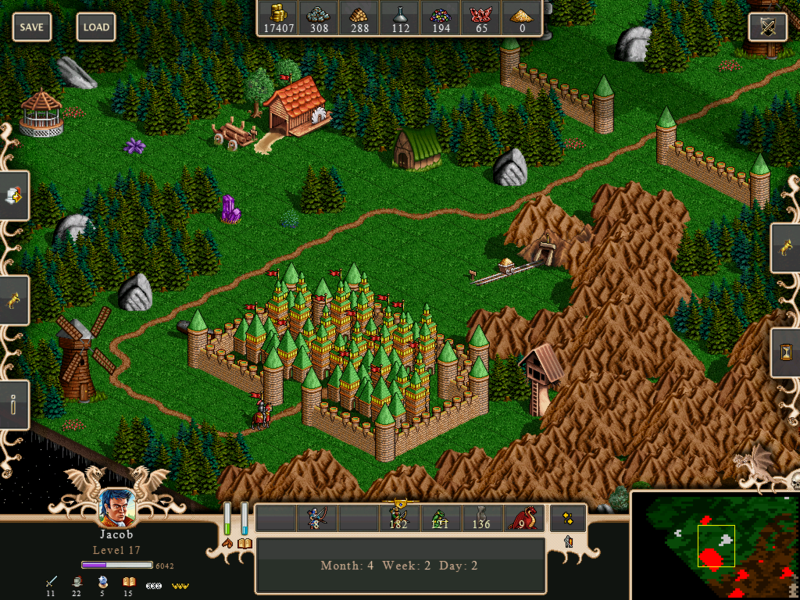 If a player controls all the adjacent land of the same type (all mountains, for instance), a town will produce many more victory points. Thus, an effective attack on an opponent might rob them of a single hex, dropping their victory point production. However, attacking territories that are part of a town/fort/stronghold are appropriately more expensive propositions. Spending all your victory points on attacking is not a long term solution, as the goal of the game is to reach a selected victory point cap (anywhere from 100 to 300 points). I found the game to have an excellent balance between a euro-style economy build-up and a slightly aggressive (and expensive) attack mode. While the field is generated randomly each time, there are a number of features to keep things interesting. The game board comes in three sizes (small to large), the number of victory points required for a win can be adjusted, and the game can be played in a real-time mode (where resources are generated at set intervals but player actions can occur at any time.) If this isn’t enough, the game can be set in four modes – normal, defensive, pacifist, and warlord. Defensive mode makes walls much more effective while pacifist mode doesn’t allow attacks at all. Warlord mode ignores victory point wins entirely and players must eliminate all others for the win. The graphics and interface are clean and pleasant, and the many modes (along with some Game Center achievements) provide more than enough gaming value for your $3. The AI is decent, not going to be a major challenge for experienced players, but I’m still willing to give the game a thumbs-up approval. EveryGame isn’t an actual game, it is simply a gaming platform, similar to things found on PCs like VASSAL and the like. Gamers can construct a game layout complete with dice, cards, boards, cardboard chits and the like, and then EveryGame takes care of managing the pieces. 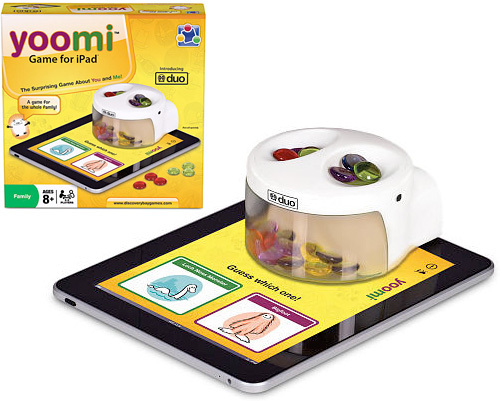 When combined with a iPad, it could be thought of as a game piece library. It isn’t a perfect system yet, but they continue to work on it and improvements are made. As one might expect, the limited screen space is the largest minus to the system. While a user can scale in and out of the primary game board, it is currently a bit difficult to move pieces from one part of the board onto another that is off-screen. Another limitation is a lack of an easy way to have hidden information in a game, thankfully there are still quite a number of Euro games out there without it. The plan for the future is to have iPhones hook up to a game for each player to have personal information displays. I have not personally had time to mess around with the programming side (done in XML) but the system shows a lot of promise. 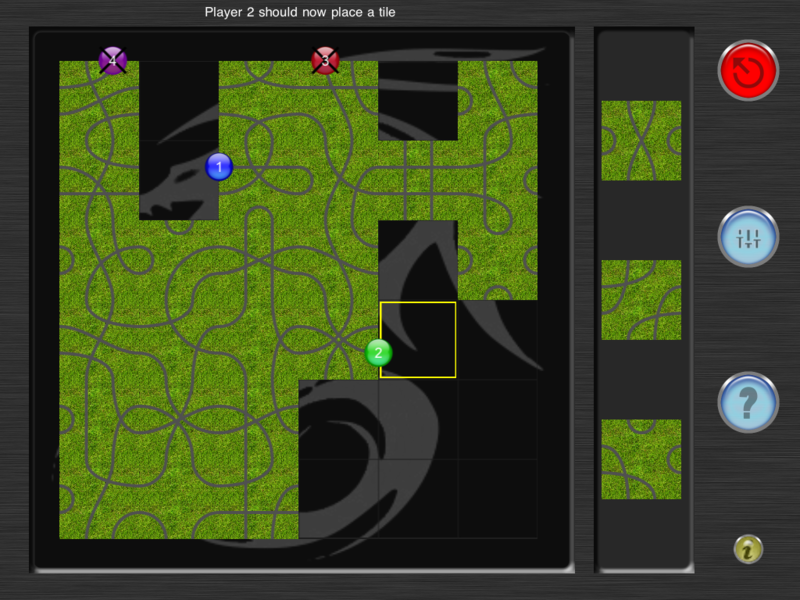 Users can create and share boardgame setups they have made. The initial install comes with many basic abstract games, but one can download additional “boards” off of the BGG and other web sites. Some of the more notable downloads include Dungeon Lords, Endeavor (including the setup needed for the solo game variant), a scoring track for Campaign Manager 2008, and even the game board for Arkham Horror (which pairs extremely well with the Fantasy Flight app for managing the cards for Arkham Horror.) $4 might be a bit much (in app-store prices, anywhere else it would be a steal) for what the system has to offer at the moment, however it just reeks of potential. This could become a must-have app for any serious iPad boardgamer who is hoping to amass a “portable” collection of boardgames. I know that if I ever have some free time, I’m hoping to try my hand at putting together a version of Primordial Soup/Ursuppe – of course anyone reading this should feel free to beat me to it! Clearly just having an iPad is not enough gadgetry for many people, you have to have add-ons like a fancy case, a portable keyboard, and the best stylus. Well, now you can even purchase an add-on that will help you play party games, the Duo. The Duo is a little container with two wells at the top that will hold little glass counters. The Duo is placed on top of an iPad, and then can read signals from the iPad using a special window on the bottom of the device. Players can put their counters on the top of the Duo, and then the iPad is able to signal the Duo top to rotate in one of two directions allowing only one well of glass counters to fall into the body of the Duo. In the free game, Yoomi, the Duo is used as the centerpiece for a party game. One player is given a choice of two options “Skiing or Swimming”, and selects their choice secretly by pressing one of two spots under the Duo. Then the other players put one of their glass counters in the well they think matches the choice made. Once all the players have voted, a button is pressed on the iPad, the Duo rotates, and all the players can see who choose correctly. Take back any incorrect guesses and the game continues until one player has gotten all their pieces into the body of the Duo. Since one needs the Duo and an iPad to play, this game is not going to be a reason to purchase an iPad. However, it is pretty fun and if you don’t mind carting around the softball sized Duo in addition to your iPad, it is worth the Duo purchase. I found the Yoomi game was exceptionally good at attracting non-gamers over to try out the game – since it incorporates “fun” technology of an iPad along with the pretty glass beads and Duo with moving parts. Hopefully the library of games designed to be compatible with the Duo will expand, making the Duo an even better value. Launched with plenty of hype, due to its connection to Magic: the Gathering designer Richard Garfield, KardCombat is a two player game that can loosely be considered a duel via a deck of cards. Players begin the game with a semi-randomly chosen set of “Kards”. These consist either of creature cards (which have attack strength and health values) or spell cards. They are not used up when cast, and do not change throughout that duel. Players have a pool of five mana types and gain one mana point per turn. Cards come in five colors and each Kard requires a specific amount of that color of mana to cast. Creature Kards are cast onto a row of slots and are then able to attack the Kard across from them, doing damage to that Kard’s health according to the attacking card’s strength. If it is empty, then their attacks hit one’s opponent instead. The first player to lose all their health points loses the game. Of course, what makes the game interesting are all the Kard options as well as the many spell effects. Any player familiar with Magic: the Gathering will find a number of similarities. I found the game play quite pleasing and I ended up playing the entire campaign game. 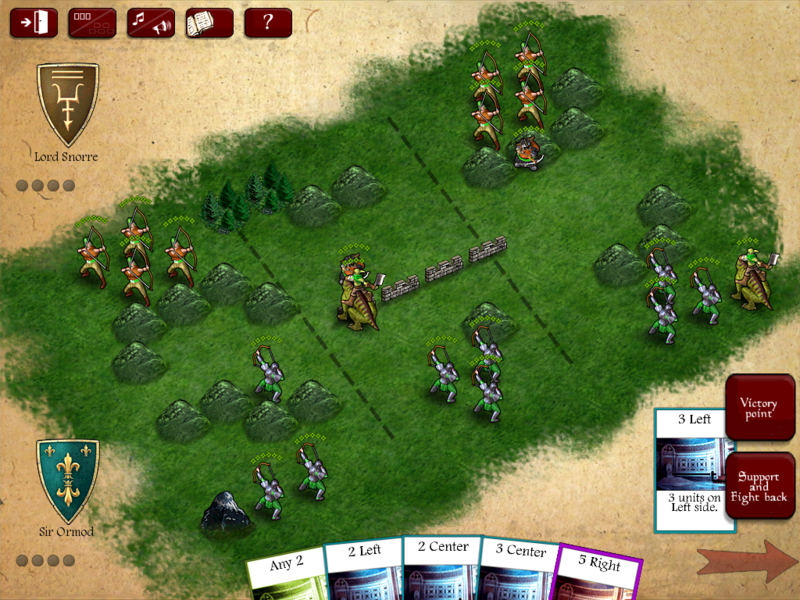 The campaign game consists of four “towers” where you defeat opponents in sequence, as they roughly get more difficult. At the same time, you aquire new Kards and sometimes special abilities (such as extra mana or health at the start) to help you defeat further opponents. The game is released free of charge, but only the first few levels of each Tower campaign are unlocked. You can spend $1 to unlock one tower or $3 to unlock all four. Complete all four towers and you’ve unlocked all the available cards in the game. (Technically, you unlock all the cards available when defeating a single tower, but only for that particular type of deck.) For those who are all about multiplayer play (and there is a pretty excited community online at the moment) can simply pay $10 to unlock all the cards right off the bat. I wouldn’t suggest this unless you were very into multiplayer and didn’t want to play the campaign at all. (Or, you really want to play on both your iPhone and iPad, since you can unlock purchases on the two with a single account, but tower-won cards do not yet carry over from one handheld to the other.) I have to admit, I’m extremely wary of collectible card games on electronic media. However, the pricing plan (as it stands now) is quite reasonable. For $4 and a little bit of playing you end up with all the cards that are currently available. Having defeated all four towers (a couple of them twice, so I finished all the towers at the hardest level), I don’t see myself getting too into the multiplayer game, but that may change depending on how the game progresses. One of the frustrating things about the game as it stands is the inability to affect one’s starting cards. If you get a poor draw of cards (not very many nice combinations) you are simply out of luck. On some of the hardest tower challenges I would simply restart until I got at least one or two cards I felt were needed to defeat that particular opponent. That doesn’t work so well in a two player game. There are four different “mages” available, with their only difference being their “5th” color of cards. All mages have the same four basic elements (fire, water, air, earth) and then the four tower campains each have a unique fifth type. There are some complaints about the choices for the 5th color being a bit unbalanced, but since much of the strategy comes from the basic four elements it isn’t overwhelming. (Of course, this also means the variety between the four types of players is much less.) I’d like to see some of the game animations sped up even more (you can adjust them, but I’d like to simply rush through them even more after watching them so many times) but other than that, I think the interface is clear and does a pretty good job. The free version of the game gives a very good taste of how the game plays, so it should be easy for fans of collectible card games to give the app a spin to see if it suits their fancy. Yet another questionable game as its developers are being legally challenged about its similarity to BattleLore. (I didn’t intend to write a column on grey-area games but several of them ended up getting into legal trouble during my evaluation.) This is very much a BattleLore-esque game complete with footsoldier, archer, and mounted units coming in green, blue, and red colors to represent their strength. Each player (Viking or British) have a hand of cards and play a card to order their units on one of the three zones on the board (left/center/middle). While the combat resolution is not explicit, combat is quite similar to the Command and Colors system where units can take damage and/or retreat depending on the result of attacks. The game provides both skirmish (vs AI or pass and play) and online game modes as well as a nice little campaign that introduces players to the various units over the course of multiple battles. The campaign mode evaluates your performance after each battle based on your losses and the length of the battle. I found the graphics to be quite pleasing and the interface seemed straightforward. My only minor quibble rested with the unit health displays. 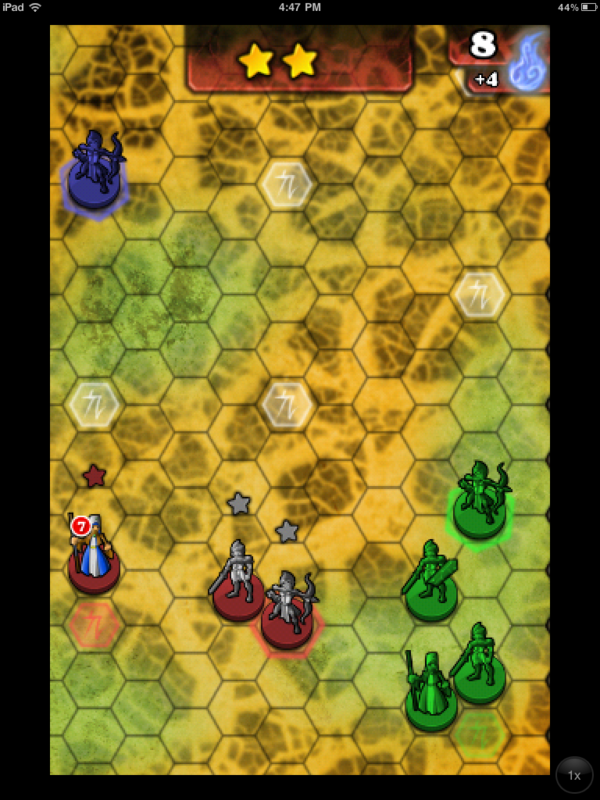 Units are shown as single figures with small green dots over their heads to represent their health (units seem to have more hit points than compared to standard BattleLore.) Unfortunately, the green dots frequently blend into the green parts of the board. A unit’s health can be discerned with a careful check, but I have mistaken a unit’s health on more than one occasion. When evaluating this kind of game on the iPad, it needs to be compared both to the physical boardgame as well as to other (non-board) games available on the platform. Viking Lords does well in this respect as its adherence to rules similar to the Command and Colors system provides it with a nice balance between simplicity and complexity. The units and terrain interact to provide enough complexity for a wide range of experiences while remaining simplistic enough for a gamer to understand the rules well enough to make wise decisions while weighing one’s options. A final bonus for interested gamers is a free “Light” version that is available so you can try before you buy. Another “old school” title on the iPad is Avadon: The Black Fortress. This is a role playing game where you play a main character (one of four character classes) who teams up with other characters (usually the ones you didn’t choose) to go on adventures. Your cast of controllable characters level up at approximately the same time, so you don’t have to constantly babysit your team of heroes to keep them at similar levels. When a character levels they gain increases to their base statistics as well as skill points to spend on an ability tree. The tree for each class has three primary paths to explore, with most upper level skills having prerequisits from other paths. However, you can pump multiple skill levels into a specific skill and gain more benefits (such as becoming even more powerful with axe based combat or able to summon more powerful minions to help in combat). Since each step on the skill tree can be specialized in, characters in the same class can have fairly significant play experiences – opening up some replay value in the game (And that dovetails nicely with the multiple endings possible.) 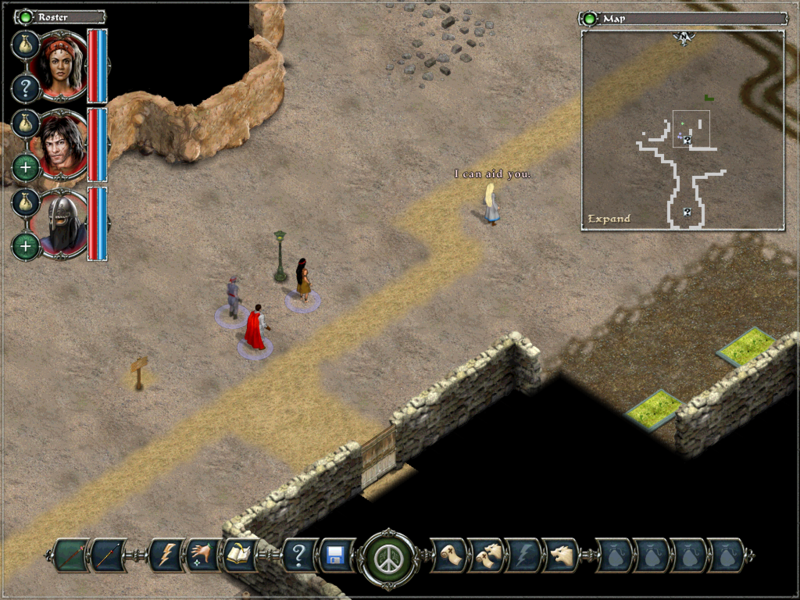 Exploration is done from a 3D isometric perspective, and when an enemy is encountered combat becomes a turn-based affair. All this is fairly standard as far as turn-based RPG titles go. What sets Avadon apart is its deep storyline and world setting. This is not a Japanese style RPG where you mash buttons in combat and kids with giant eyes summon ghosts to help them save a princess with magic crystal. Instead, Avadon presents a fully fleshed out world with a lot of moral ambiguity for players to explore. The nation is at peace, but is run by a moderately harsh taskmaster – is that good or bad? That is up to the player to explore. While I have not yet finished the game, I’m pleased with the story progression. There are small side-quests that deviate only slightly from the main storyline, but the primary plot seems strong enough so that I don’t feel the need for more of a sandbox feel. At $10, it is pricey for an iPad app, but what you are really buying is a computer RPG (it is even available on the MacOS if you prefer that) at a very inexpensive price of $10. This isn’t a casual game, but if you’re interested in a large, deep RPG in a nicely fleshed out world, you wouldn’t go wrong with Avadon. Not a physical card game (yet), Brainfreeze by Seth Jaffee (That is the full name, to differentiate it from the myriad of Brainfreeze games on the app store) was created by Tasty Minstrel Games, the small publisher of the boardgames Eminent Domain and Homesteaders (among others.) 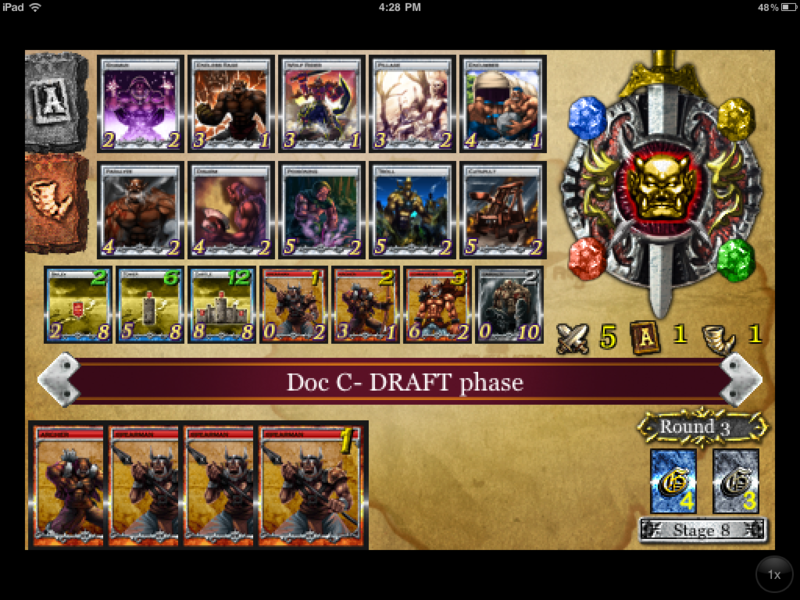 Their first foray in the the realm of iOS gaming is a quick little speed card game. 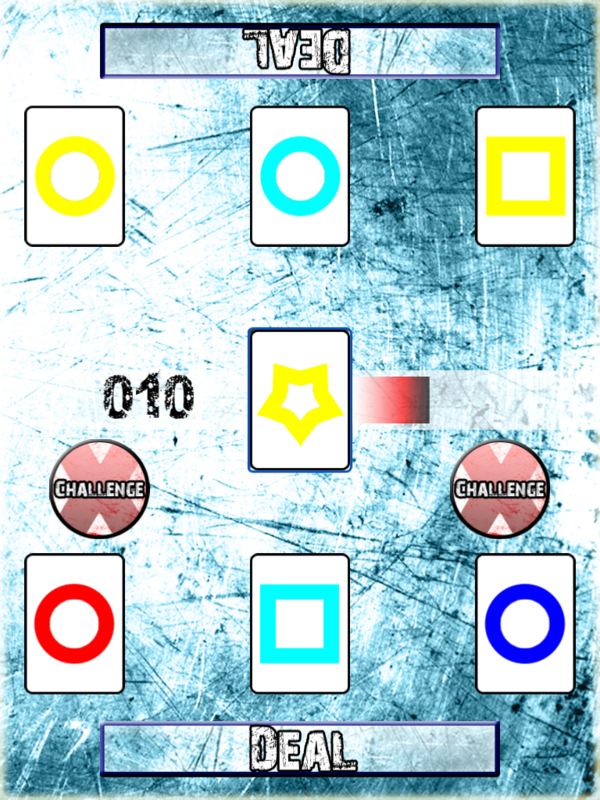 Given a set of 3-5 cards, match either the color or shape of the card in the center of the board. Played as a two player game, each player has a timer that ticks down while they are looking for a match. The player who runs out of time first loses. There is also a solo mode where you play against a computer opponent and attempt to make as many matches as possible within a time limit. A nice little high score table keeps track of the best runs for each time limit (from 15 to 30 seconds). Not going to beat out anything for dept of strategy, but the price is right (free) and it is a nice little time waster. Fans of card games like Speed or some of the speed matching card games should take the time to download this free game and take it for a spin. On the recommendation of someone’s comments from my last iOS roundup, I took a look at the Helsing’s Fire puzzle game. It isn’t a boardgame, but does have some nice puzzle elements that I think would attract many boardgamers. The basic concept is a small, fairly open maze infested with bats, rats, and other vampire-themed nasties. You must destroy the nasties by exploding vials of colored chemicals. Each vial only destroys nasties of its own color, in fact, if a red vial affects a blue nasty it gains a special protective “red” layer that can only be destroyed with another red vial. These layers can form up like an onion, requiring the right sequence of potions to destroy. The uniqueness of this game is how the potions are executed. They explode in a flash of light, and any monster exposed to the light is destroyed. Thus, I’m trying to place my blue potion to expose all the blue bats while keeping all the red rats hidden in shadow. The interface helps greatly, as the shadows move and respond as you drag the potion around on the screen. If this all isn’t enough, eventually there are innocent bystanders present which can be harmed by the effect of any potion. Since there is no time limit, it is a nice little puzzle game for people who like to think things through. However, the game does track your speed so you can go back to levels to try to decrease your time. With three campaigns available (of 90, 30, and 60 levels respectively) and more levels released as world-wide challenges, you are going to get your money’s worth. I particularly enjoy playing on my iPad as it has a nice large screen and it seems to be more responsive to how I place my potions. In a sea of many similar “puzzle” games, I found this to be quite unique and worth a look for fans of logic-based puzzles (as opposed to speed based puzzlers like Tetris or Bejeweled). Many boardgame apps continue to get updates after their release (contrary to the world of the physical boardgame.) Ticket to Ride now has labeled menus and pass and play modes (my two biggest gripes) and BattleLine has had a huge update to include asynchronus online play as well as a set of achievements. In what has been one of the most sought-after iOS games, Puerto Rico is set for release any day now. It will sport 3 to 5 player capability in online, pass and play, and local (I assume Wifi) modes. The pass and play even rotates the screen appropriately for each player. The computer AI comes in three levels, as well as a built-in ELO ranking that modifies the computer AI to fit your level of expertise. No achievements, “campaign” mode, or expansions at this time, but it looks like the meat of the game is there. Disclaimer: I did receive a free copy of a fair number of the above games for review purposes, although I did personally purchase a few. 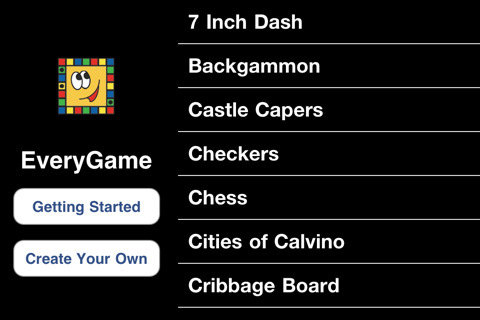 1) Everygame looks like it has a lot of potential to be the next “killer iApp”. I say this because the possibilities are almost limitless – just playing around with some of the boards available for download and once the personal information thing is worked out, it could be a great way to have a huge portable boardgame collection on your tablet. 3) At this very moment, nothing beats Ticket to Ride for look, playability, etc. Adding pass-and-play was all it needed to top Carcassone for me. Erik Arneson: I will second the opinion that Ascension: Chronicle of the Godslayer is indeed very well done. A great implementation of a top-notch game. This entry was posted in Commentary, Reviews. Bookmark the permalink. I’ve heard that iPhone and iPad apps can be run on Snow Leopard, using something called Java Development tools. Does anyone know where I can find out how to do this, step-by-step? I’m interested in Everygame as a board game prototyping tool. I don’t know how easy it’ll be to put together board layouts, etc. but I see good potential there. Btw for all fans of the online/PC game ‘Spectromancer’: KardCombat is a nearly exact copy of this game. It was released with the help and support of ‘3 Donkeys’, the developers of ‘Spectromancer’. Puerto Rico just came out here in Australia this morning, and it looks very good. Played once and they’ve done a great job presenting all the information on an iPad screen. It would be a nightmare on an iPhone/Touch. Have you played Dominion (the RISK clone)? How does that stack up against Conquist 2? I thought Dominion was definitive (it’s ported all the Risk Revised objectives, etc)! I’d echo Doug’s thought aabout Puerto Rico. Everything fits on one screen and you can play without reading the rules if you know the boardgame. I have found that some iOS games can get me into a board game. Ghost Stories is the example for me at the moment as I struggled with enjoying the board game but the ipad version is good as the ability to touch an icon and find out what it does really helps. There is still a steep learning curve but the ability to learn on the move is a great benefit. 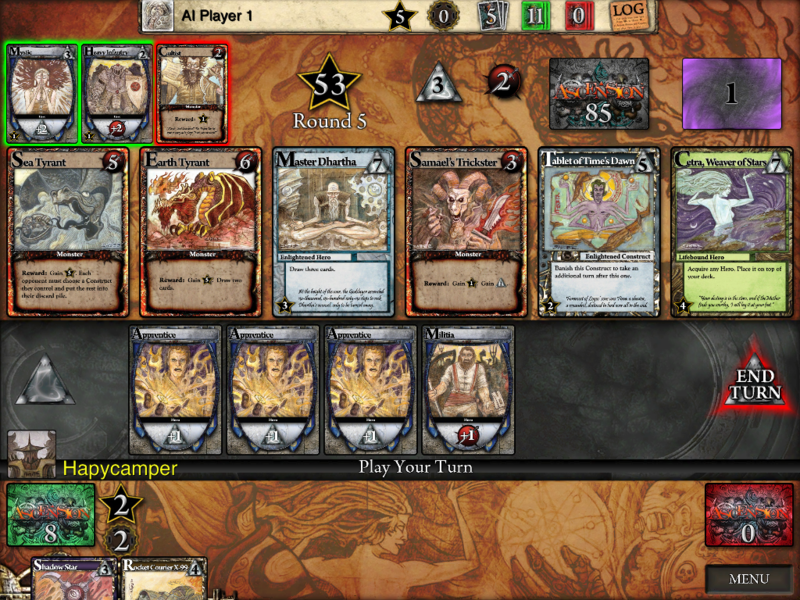 I have clocked up over 100 Ascension games now and now the card game has got expansions out I want these on the ipad. It’s a far better game than I reaslised with the card version and is another game that has drawn me back to the paper and cardboard versions of games from the iOS ones. I play Age of Conquest (Europe) for my Risk fix. It also comes out in a variety of world lands. (Americas, Asia, World and others). Does anyone else use DIcenomicon for all dice rolling now? The ascension expansion comes out this fall. It’s now in beta. The same folks will also be doing nightfall and summoner wars. I just got ghost stories and plan to review it next round. I don’t use any electronic dice rolling, maybe if I was a dm and had to roll more dice for speed but I just love plastic. I once tried to get a die roller programmer to add in dice for memior 44 or battlelore…. A really outstanding survey. I feel that I have kept up with boardgame releases on the iOS, but you still had a few I missed (and promptly went to download). I agree that Gundabad is a Dominion clone/rip off, but what is strange is that the iOS version never grabbed me the way the real game did. Can’t quite figure out why. Got Puerto Rico last night and have already logged 6 games. My one complaint is that I can’t hold my finger on an item (like a building) and get a pop up with more information. I played the boardgame a lot, but it’s been a while and I needed the memory jog a few times and couldn’t get it. I guess that’s what updates are for. Outstanding survey. I feel like I keep up with potentially interesting new releases, but you had a few here that I didn’t know about. So while I already had Ascension and Gundabad, I stiil wound up download a few more. New World Colony and Kard Combat both got a ton of play this past weekend and are well worth the money asked. Thank you for pointing me their way.